Preheat oven to 325 degrees. Remove meat from package and place on a rack in a foil lined pan, fat side up. Sprinkle spice packet over corned beef. Place the pan in the oven, and add about 1/2 to 1 inch of water to bottom of pan. (water level should be just below the rack.) Cover the pan with foil. Bake about 2 1/2 to 3 hours. In a large pot with add red potatoes, carrots and cabbage. Add enough water to steam vegetables. Cook until tender. Keep covered until ready to serve. After 2 hours of cooking corned beef, uncover and brush glaze over top. Continue to cook the beef until internal temperature reaches 160 degrees, re-glazing every 15 minutes or so. When done, remove from oven and let rest for 10 minutes before slicing. Always slice meat across the grain. Arrange corned beef and vegetables on platter. 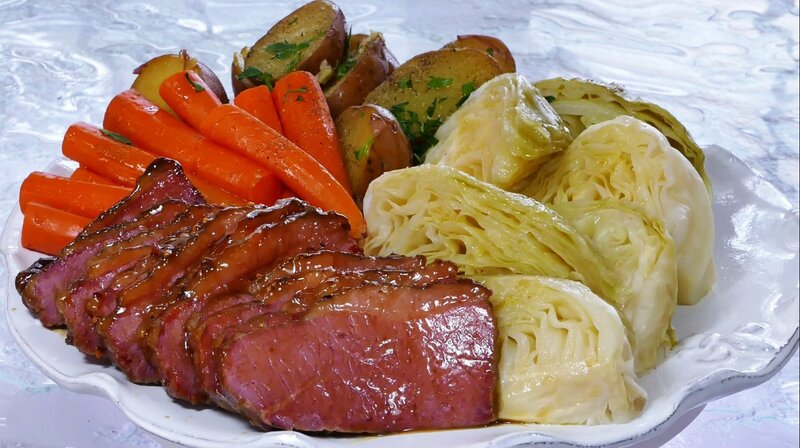 Brush sliced corned beef with reserved glaze.